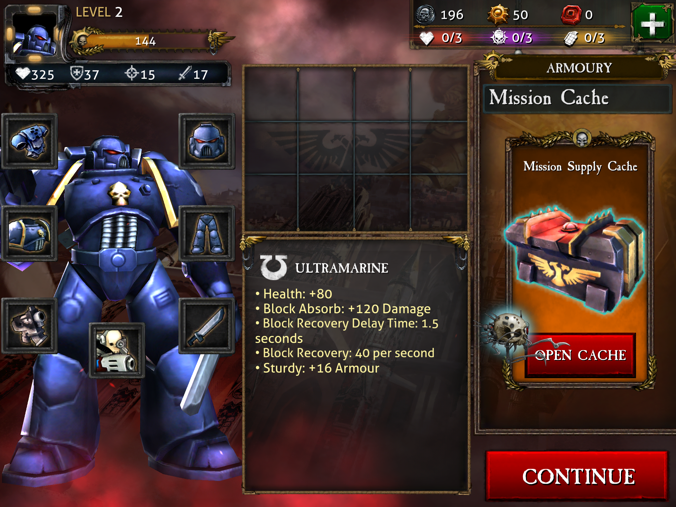 As I discussed in my review of Deathwatch – Tyranid Invasion, I’ve been traveling a lot recently, and there’s something futile about painting in a Hilton Garden Inn, so instead I’ve been exploring the wealthy of iOS games that might help scratch the same itch. Today, we examine Warhammer 40,000: Carnage by Roadhouse Games, which I’m going to refer to as Carnage for the rest of the review. Honestly, Carnage starts out a little on the pricey side at $6.99, and features in-app purchases in the form of Gold Stars, which can be used for anything from unlocking new skins, purchasing equipment, or respawning instantly in the game. While I haven’t found any of these in-app purchases particularly necessary, they’re definitely there. Unlike Deathwatch, Carnage does require an internet connection – and this is the first mark against it in my book. I can understand having an optional internet connection requirement for online play, in-app purchasing, etc. but not for basic gameplay. While others might disagree with me, the requirement for an internet connection vastly reduces the utility of an app. There will be no playing it on an aircraft, nor on my commute as cellular signal pops in and out of subway tunnels. Or when hotel wireless is…dubious at best. But, assuming you have a connection, how is the gameplay? Carnage is, at its heart, a side-scrolling action game. Run forward, run back, block, shoot and melee. Those are your options. 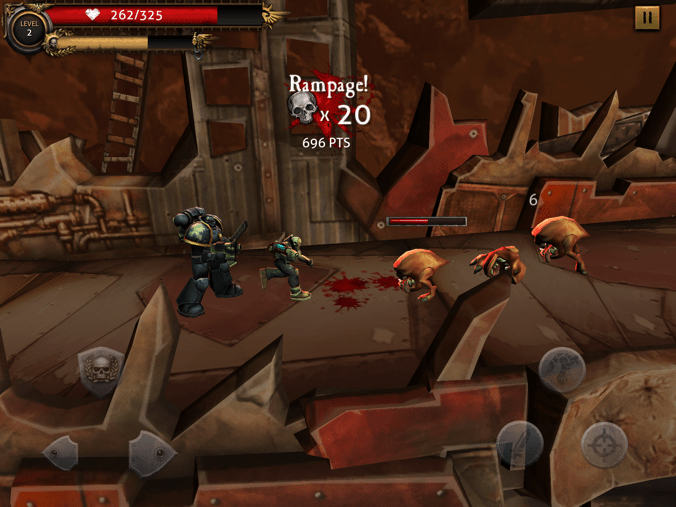 Charge through the levels, murder a tremendous number of Orks, get to the end, rinse, repeat. If you spent more hours and quarters at any arcade in your childhood playing any one of a number of side-scrolling shooters (my personal favorite was the Aliens one), you know what you’re in for. The controls are adequate, though I imagine the game is somewhat more entertaining with a proper controller setup. The levels are linked together by the crudest semblance of a campaign – you start out as a big badass Ultramarines captain, who you promptly lose contact with, and are dropped into a single Battle Brother sent to go find him. 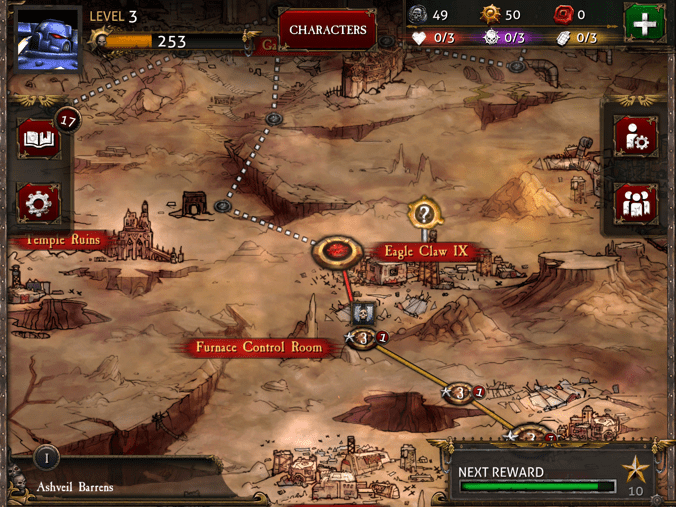 Along the way, you pass through a linked series of levels with a modicum of choice. In truth though, you’ll probably end up exploring the entire path, for the simple reason that you kind of have to – after each mission you get a package sent from orbit with some extra gear, but the cost of that gear well exceeds the currency you get from completing the missions. You’ll have to grind, and while you’re going back and replaying levels, exploring the other branches is a pretty clear no-brainer. Those equipment drops do have a meaningful impact on your character though, granting special abilities and generally making you more awesome. There are some choices to be made, but generally they stick to 40K like themes (Plasma Gun > Bolter) and have the now ubiquitous Green-Blue-Purple gear quality rating to them. Artistically, as you can see from the above pictures, Carnage is definitely rocking a cartoonish style. I don’t necessarily mind that – realism isn’t necessarily what I’m going for in my 40K, and cartoonish art ala World of Warcraft has remarkable staying power. Unfortunately some of the art elements are less impressive – I find the movements of the main character themselves to be fairly crude, and many of the animations to be somewhat underwhelming. For example, Shoota armed Ork Boyz are animated as shooting whether or not they’re actually firing – the choice to defend yourself is prompted by the bullets that appear. My biggest problem with the game is that there’s nothing inherently “40K” about it. As I said above, it could be any one of a number of licensed properties with some swapped in art elements. This one just feels like it’s had 40K bits glued to it. For example, you run into not away from a Drop Pod – why? And if a Captain has gone missing, why are we sending a single assault marine after him? And a poorly armed one at that? Unlike Deathwatch, or some games to be reviewed in the future, this one just doesn’t click for me in terms of scratching the 40K itch. It’s a decent enough side-scrolling shooter, but of all the mobile games I’ve played, it’s the least in tune with the feel and setting it’s supposed to be in. I might be able to forgive it if it didn’t have the internet connected requirement – after all, 15 minute subway rides are the perfect kind of setting for some mindless Ork shooting, but this game sidesteps it’s best shot for me. And with a price tag substantially higher than some better games, that’s not a good thing. Next Post: Has the Horus Heresy Slowed Forge World Down?